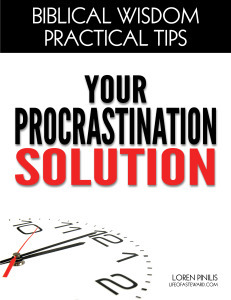 If I could be so bold, I’m proud of Your Procrastination Solution. It’s the result of hours and hours of studying psychological research, practical tips, and scriptural perspectives on procrastination. I considered writing a lengthy resource, but I know your time is valuable. So after combing through a mountain of materials, I’ve boiled everything down to a brief ebook that’s short enough to be read on your lunch break. And it’s my privilege to give this to you for free. Again, I considered charging for it simply so that others would value it enough to actually read and implement. But I hope the content speaks for itself. I’d be honored if you would share it with anyone else you think might be helped. I’d be honored if you would pray with me that it helps many. To God be the glory! To download it, simply click here and sign up for the Life of a Steward newsletter.